Wing span: 1 5/8 - 2 /12 inches (4.4 - 6.3 cm). Identification: Upperside is bright orange-brown; summer form has hindwing with a wide dark border, winter form has the border covering only about 1/4 of the wing; both enclosing a few small yellow spots. Underside is charcoal gray with fine dark striations; forewing with 3-4 light chevrons in a dark border. Silver mark in center of hindwing is small, slender, and L-shaped. Life history: In midafternoon, males perch on trees or shrubs at the edges of clearings to wait for females. Eggs are laid singly on leaves of host plants; the caterpillars feed underneath. Adults overwinter. Flight: Two flights: In April and May the winter form emerges from hibernation, mates, and lays eggs which develop into the summer generation. Summer adults fly from June-August, laying eggs of the winter generation which appears in October and then hibernates. Caterpillar hosts: Gooseberries (Ribes) and azalea (Rhododendron). Adult food: Sap; rarely flower nectar. Habitat:Along dirt roads, along streamsides, and within clearings in rich deciduous or confierous woods, in aspen parks, yards, and gardens. Often in hilly terrain or canyons. Range: Northwest Territories and British Columbia south along Pacific coast to central California, southeast through Montana, Utah, Colorado, and the Dakotas to eastern Nebraska, central Kansas, and central Arkansas; east through southern Canada and the northern United States to Maine and the Maritimes; south in the Appalachians to North Carolina. 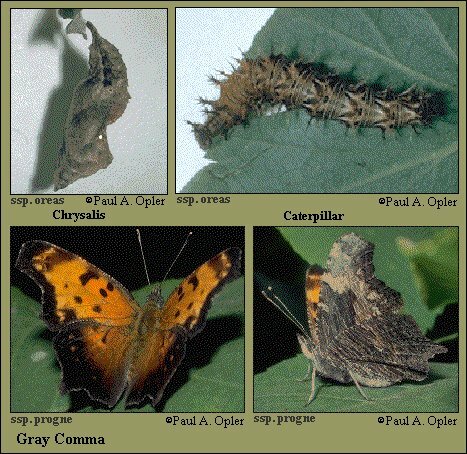 Note: The Gray Comma includes Polygonia oreas and its subspecies silenus and nigrozephyrus. These were previously treated as a separate species.